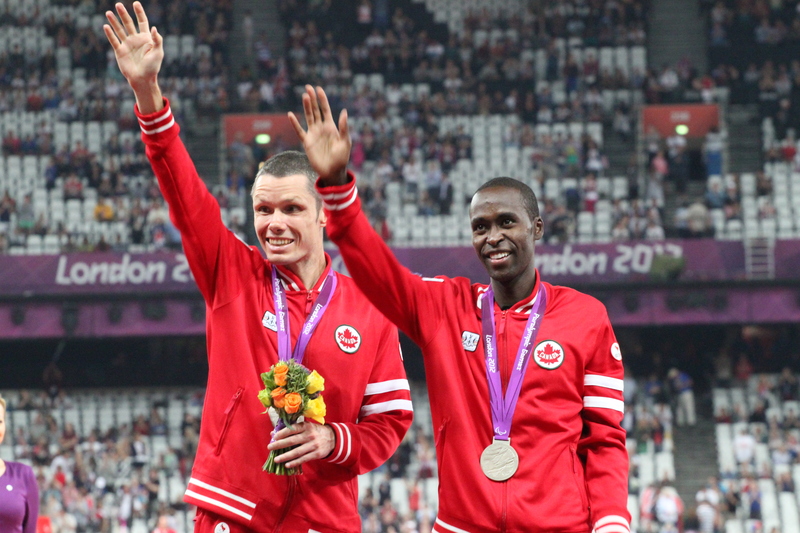 When his wife needed a kidney, blind Paralympian Jason Dunkerley didn't think twice. How do you play soccer if you can’t see the ball? Jason Dunkerley and his brothers, who are all blind, had to get inventive. As boys growing up in Northern Ireland, they would adapt games so that they could participate. Jason remembers, for example, tying a plastic bag around their soccer ball so that they could hear where it would fall. It’s this flexible persistence that saw Jason succeed in a range of sports, with the encouragement of his parents who–uniquely among parents of vision-impaired children–encouraged him to take part in physically active sports.Once the family moved to Canada in 1991, he was enrolled in a school for the blind that prioritized sports achievement. Jason Dunkerley and his guide runner representing Canada at the Paralympic Games. It was here that he first caught the bug for running. There, Jason’s favorite teacher acted as a guide runner. Guide runners assist visually impaired runners, sometimes with a tether, and are recognized as a partner in any running Paralympic success. By the time of his final year in high school, he made an 18-second improvement to his 1500 m time, from 4:52 to 4:34. Since then, Jason’s passion for running has driven him to become a successful athlete, representing Canada at the Paralympic Games. Having most recently competed in Rio de Janeiro, he’s a five-time medalist in middle distance track, having won both the silver and the bronze. But the most strenuous challenge of Jason’s life hasn’t been sports. It’s donating a kidney to his wife, Colleen, who is also visually impaired. Colleen lost her sight as an adult and Jason says she faced her new reality with a courage and strength that were some of the qualities that first attracted him. They were introduced as students, by mutual friends and began a slow burning relationship that led to their engagement at the Paralympics in Athens. Jason calls Colleen his “#1 fan” and says she has always been totally immersed in his sport even though she is not a runner herself. They combine their love for travel with Jason’s competitions and have travelled all over the world together. It was on one of these trips that life suddenly became complicated. The chain of events that led to the couple’s life changing surgery began in 2008 when Jason was competing at the Beijing Paralympics. Colleen was traveling to join him, but became very ill during the flight. Upon landing, she was admitted to a hospital in China, where after a few days, she was diagnosed with renal failure. Despite her ill health she wasn’t about to miss his big moment. Treated by doctors, Colleen was released in time to see Jason and his guide compete in the 1500 m final. But the pervasive nature of kidney disease meant that the couple knew it was just a matter of time before she would require a transplant. And in 2012, when Colleen began dialysis, the transplant became urgent. “The medical team prepares you for every possible scenario. You know the odds of success are heavily in your favor but surgery is surgery and anything can happen,” he says. Despite the couple’s fears, the operation was a success: as Jason came out of anesthesia after the operation, his surgeon told him that the kidney started working right away. 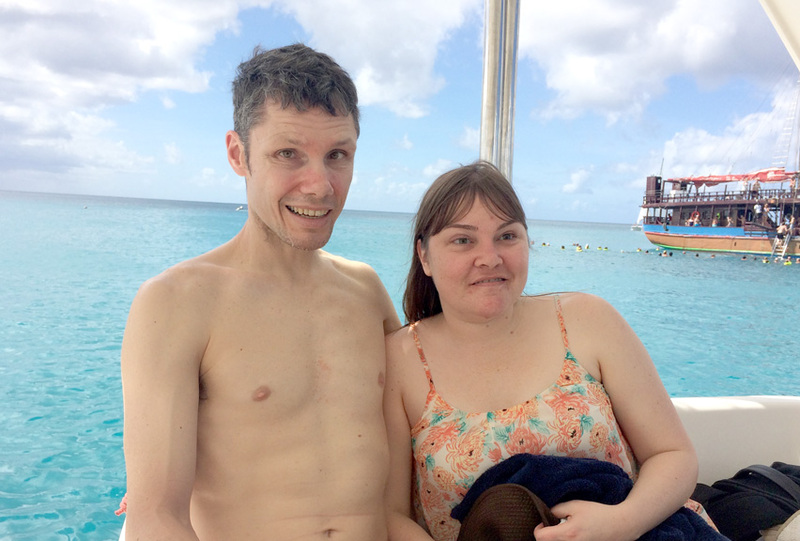 Jason and Colleen on vacation in Barbados. Yet recovery was ahead of them. Strenuous exercise was vetoed, but the pair walked together daily, during which Jason didn’t run. Instead, the couple fundraised for ‘Alive to Strive” a charity that works to raise awareness of kidney disease and educates the public about kidney health, by completing 5K races. Today, Colleen has regained much of the energy she was lacking during the years of her kidney failure. However, she still loves to nap, curled up with their beloved cat, Gracie. Jason jokes that sleeping, is in fact, one of Colleen’s favorite hobbies. Jason says that his connection with Colleen has been strengthened through their donation experience. It’s actually quite rare for spouses to donate kidneys to one another, says The National Kidney Foundation. In fact, only 13% of kidney recipients are married to their donor, making it in many ways the ultimate romantic gesture. In addition to literally giving your life to your love, there’s something supportive about healing together, and jointly shouldering the burden of recovery. That’s a burden that Jason refers to in a surprisingly positive way: “It was a privilege to be able to take this journey together with Colleen” he says. Despite the threat to her quality of life, Colleen was the more relaxed of the pair in the run up to the transplant, she gave strength to Jason, who shares that he was feeling very nervous about the surgery. “Going through something like this inevitably brings you closer,” he says. Following the operation, the disciplined runner took just 6 weeks off to recover. Apart from some post training fatigue, he returned to full form and was back competing in the Rio games in 2016, running within less than a second of his 1500 m personal best. Runners hate slowing down, of course. But they also know how to pace themselves. While many people would have considered an organ transplant as a setback in life, Jason feels that for he and his wife, it was a necessary pause. Colleen and Jason enjoy full and rich lives, including successful careers in marketing and government, an active social circle as well as their commitment to health and fitness. They still enjoy traveling, most recently vacationing in Barbados, and love to spend quality downtime together. A typical weekend sees the pair taking walks around their city neighborhood, grabbing a coffee and sharing Sunday dinner with family. Even though Jason is officially retired from competitive running he can’t quite shake the habit. He admits that he still runs 6 days a week, sometimes twice a day. Colleen knows how important running is to Jason and the role it has played through most of his life. She has always been his greatest champion, ensuring he is well fed and rested for competition and has attended most of his races. When her kidney function deteriorated and she needed him the most, he was prepared to potentially jeopardize his health and his ability to compete in a sport he excels at on the world stage.